I originally put my veggie seeds in cheap seed starting soil, and while it was advertised as organic, it just wasn’t high quality. My seedlings sprouted and after a couple weeks they started to die. 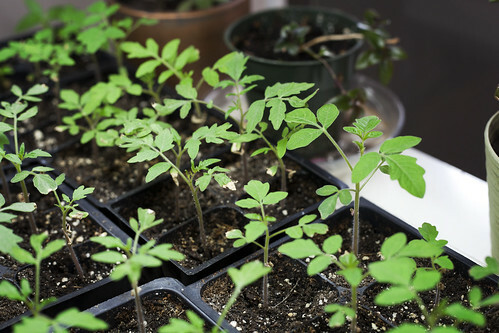 I knew I had to do something fast if I didn’t want to lose all of my baby tomato plants, so I did a bit of research about seed starting soil. The photo below was taken right before re-potting. The sad looking little plants you see below were that size for at least 2 weeks. They had sprouted, grown a few inches, and then started to die. I was really bumming out, because I’ve been plagued with poor seed starting results for years. This year is the first year that I’ve used a Grow Light System for my seedlings, and I thought that it would miraculously make my plants invincible. I was wrong. If you look at the photo above, you’ll notice a difference in the soils. The one nearest the camera is darker, and is the new and improved dirt. The rest are all still in the older, crappy seed starting soil. Believe it or not, the healthy looking plants below are the same plants! And this second photo was taken only 10 days after I repotted them. (They’ve since doubled in size again, and are nearly ready to go outside). 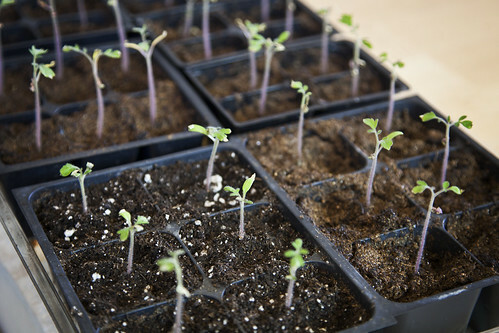 So, you may be asking what this magical seed starting soil is. Fox Farm (click HERE to see a retailer near you) is the creator, and the soil is Ocean Forest. It’s all organic (yippee!) and has plenty of nutrients for your little seedlings. The nice thing about this soil is that it holds moisture! My first seed starting soil was really bad at holding moisture and always seemed dry; water would either sit on top of the dirt or go right through. Boo. If you don’t have a Fox Farm retailer near you, you can get a 12 quart bag of Ocean Forest Organic Soil here . (The two Amazon links in this post are through my affiliate account. If you make a purchase, I will receive a small commission, at no additional cost to you. If you use either of them, I’d like to thank you for your support!) Any seed starting soil will be a bit more expensive to buy online, but well worth it if you’ve had troubles with starting seeds. With a quality soil, you should have strong and healthy plants! I’m still waiting to put a lot of mine out in my garden, but they’re quickly getting too big to keep in the house! Our weather forecast for this weekend is not great for tiny plants; we’re supposed to have temps in the low 50’s, rain, and winds gusting up to 30 mph. Yikes. I think I’m going to have to wait and plant them next week on one of my lunch breaks. It’s tough to wait when I’m feeling so impatient to get my garden started, but I know it’ll be more beneficial to wait at this point. So how are everyone else’s gardens doing? I realize I’m usually planting my garden much later than most of you, seeing as I’m in chilly zone 3b. But if you’ve already started your garden, I’d love to see photos! Feel free to comment with links to your blogs, especially if you have jealousy-inducing garden photos! Previous PostWeekend Warrior Edition – New Camera! how many 12 quart bags Fox Farm do I need? My garden is 100 square Ft.